Handmade area rugs are the most important accessory for a home. It is either a modern carpet or traditional design. Selecting the pattern of a carpet totally depends on the interiors of your home. It is not possible that you replace all existing accessories in order to place a carpet which contains different pattern and color combination. You should take a carpet according to your home interior and existing products. A handmade carpet is an exclusive thing because it contains “one of a kind” design pattern, woven in a purely natural material and takes many months to weave. A home can be decorated in two ways. The first one is traditional and second one is modern or contemporary. Traditional design carpets are woven in wool or in silk but a modern carpet is usually woven in wool. A modern carpet contains less design pattern as compared to a traditional design carpet. Handmade modern design carpets are woven in both techniques like hand knotted technique and hand tufted technique as well. You can find beautiful handmade carpets at a very reasonable price because many companies provide offers and discounts. Rugs and Beyond has added some of the most beautiful New Arrival Modern Area Rug collection. So, Shop modern handmade carpets from Rugs and Beyond at unbeatable price. This rug is one of the most beautiful carpets from New Arrival Modern rug collection. The base of this rug is in cream color and contains blue and green spots design on the top. 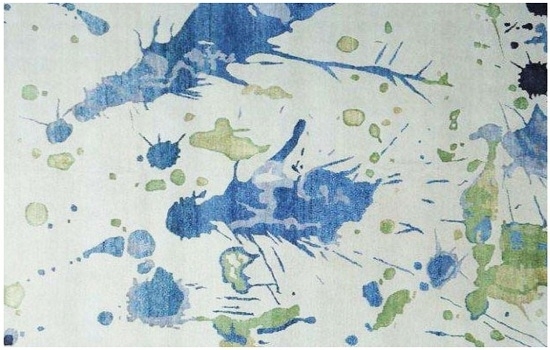 The design of this rug is inspired by the Ink spot on the floor. Ink Spot Large Modern Carpet is made in handspun wool and bamboo silk on the base of cotton. It is woven in Handknotted technique. It is a large area rug so you can use it for a living room, a bedroom, and a dining room as well. It is ideal to cover the entire space. If you have a small room then it is perfect for you because a large area rug reflects a small space as the large one. As we know that a handmade carpet is used for flooring as well as for wall hanging too. After decorating your floor its time to decorate your wall as well. 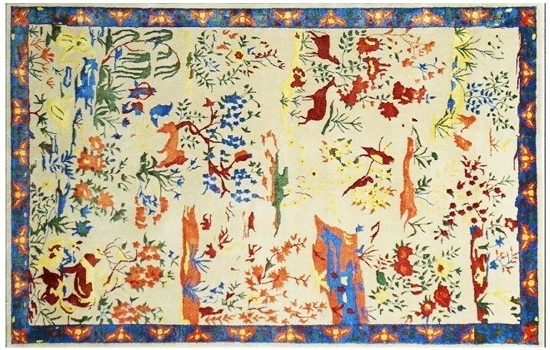 This is a wall hanging area rug which contains a pictorial tree of life design. This design is inspired by an ideal forest. It is woven in Handknotted technique and has been taken about 7-8 months to weave. It is made in handspun wool + bamboo silk as weft and finest quality of cotton on the top. It has a very soft and cozy touch. So, keep your room cool this summer by hanging this beautiful area rug close to your window. It is 100% hand washable and a highly durable area rug. If you want then you can use it for floor covering too. Need a circular rug for your coffee table? Check out this sky fall Victorian woolen rug which is made in pure New Zealand wool and cotton material. It is a handknotted area rug and contains a sky blue color. This is a large circular rug so you can put it below your circular dining table too. So shop these ones of a kind, handmade rugs and carpets from your favorite rug store and enhance the beauty of your space.